This was my first Diva event. 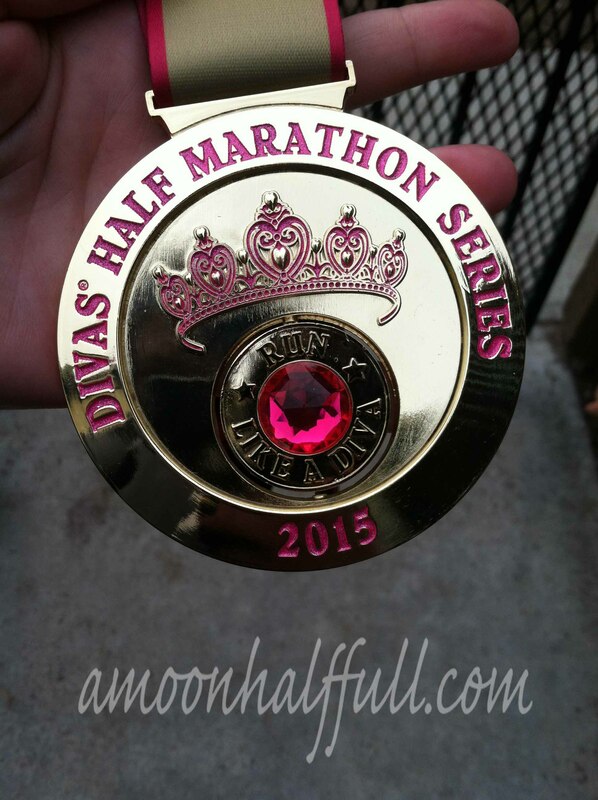 I was enticed by the proximity to my home, just an hour away, as well as all the fun extras that were advertised: wine tasting, tutus, unique and gorgeous medal, entries capped at 2000 runners, gorgeous course through wine country, and free race photo. All this in addition to the usual boa and tiara that is passed out on the course. This race looked like a blast. I found a closed Facebook group of other ladies who were also signed up for the race. It was cool getting to interact and bounce questions off of each other before race day. The days leading up to race day were rainy and it was a question as to how wet we were going to get on the course. I also had the ever-present dilemma of what to wear. Not wanting to be too hot or too cold. I ended up wearing a tank top and a t-shirt over that. I was able to take the t-shirt off and stuff it in my Camelbak. Friday I drove up with my kids to Temecula to pick up my race stuff. The expo was very small, only a few vendors. I didn’t bother looking around as I didn’t have extra money to spend and I didn’t really need anything. I let my kids run around a bit since we had been in the car for an hour. We decided to have some lunch there. The menu was nice and what you might expect at a winery. 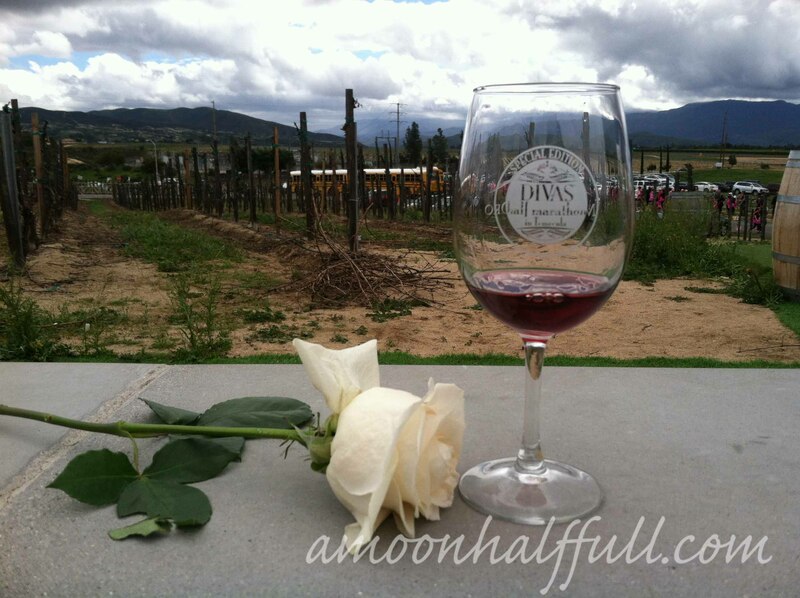 I opted to save my wine tasting for after the race so I could enjoy it in peace. Race morning I left my house around 4:30 am and arrived in Downtown Temecula around 5:30. There were lots of other runners driving around trying to park. I saw some people were parking anywhere they could. I followed the people directing traffic towards the parking garage that the Diva race info cited as being the place to park. It was full. Now I was stuck in a traffic mess back towards the parking area I had initially seen people driving into. I couldn’t figure out why they were still directing people to the garage when it was full. I finally parked in some other public lot and got on the school buses that were being used to shuttle us to the race start. By the time I arrived at the winery it was 7am, only 30 minutes before the race start. I headed to gear check which was located directly opposite from the porta potties. It was wall to wall people waiting for the potties. I have never seen any thing like it. I had to squeeze and shove my way through the crowd to get to gear check. I handed my bag over and turned around to a wall of people facing the porta potties and decided to just be in line for the potty. The line was moving SO slow I was so worried I wasn’t going to get to the race start on time. Seriously they needed more porta potties. Come on Diva, this isn’t your first event. You should have this stuff down by now. I made it to the front of the potty line and finished my business. Now all the people who had just used the potty were now trying to get into the corrals but we just could get in. The corrals were too full. I couldn’t get into the first wave and just decided to wait until those runners started and made room for us to file into the corrals. I kept reminding my self to stay in the moment and have a nice attitude. I was seriously feeling a bit flustered. I definitely didn’t want to be a drag by complaining to any of the other runners as we all just wanted to have a good time. The race started. The pack spread out pretty fast. I just tried to enjoy the scenery. The course was advertised as “California flat”, whatever that means. They really tried to down play the challenging nature of this course. It was hilly and almost half of the race is run on a dirt road with scattered gravel . I found myself looking down through a majority of this portion because I was afraid I was going to eat it. This portion is some of the prettiest views on the entire course. I had to remind myself to look up and take it in. Around mile ten I heard another runner say that she just didn’t think she could face another hill. Of course this was as we were approaching yet another hill. This was my free race photo at the finish line. I was sent two and this was the best one, ha! I gotta learn to mug for the camera. 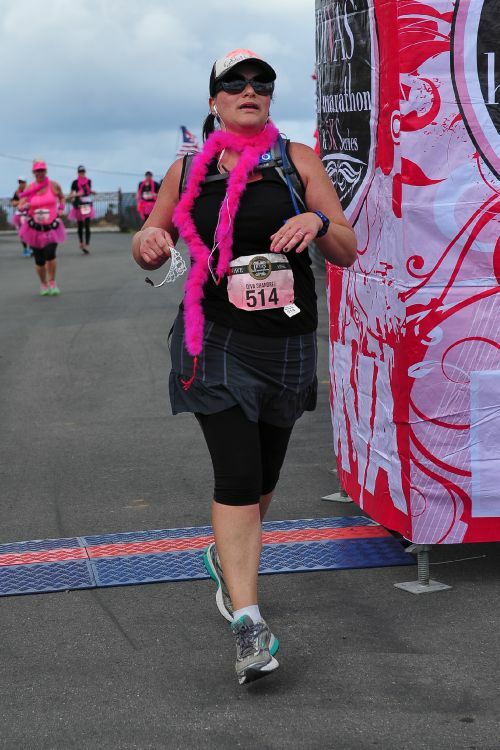 Just before the finish line we were given our boas and tiaras. Such a nice touch. I was pleased to be almost finished. Wouldn’t you guess that the finish line was after a small hill?! At the finish I was given my medal. I passed on the shirtless hunk photo and proceeded to get my rose and my water. What I really wanted was some electrolyte replacement. I left the finish area in search of food. It was located in an area that wasn’t obvious and not well-marked. I had a hard time finding the food but after asking some folks who looked like they were eating race food, I managed to locate it. It was on the opposite side of the campus. I finally got my snacks and still didn’t get any electrolyte replacement. I ate my snack and then went to do my wine tasting and get my glass. This part was a mess. I went inside the winery where the tastings were happening the day before. After waiting a while I finally got a person to acknowledge me only to be told that the race day wine tastings were outside in a tent. I went out to yet another crazy line and was worried I’d have to abandon my wine tasting because I was cutting it close to the last shuttle leaving at 12 noon. Luckily, the line was moving fast enough. Once in line I was told by other runners that they ran out of the wine glasses and were giving us regular ones not the Diva glasses we were promised. Again, lame. By the time I got to the front of the line they had managed to find another case of glasses so I was able to get my souvenir. Some of the ladies in my Facebook group left with out their glasses because they were told there weren’t anymore. They ended up emailing Diva and after several months, finally received their glasses in the mail. The wine tasting was really not that big of a deal after all. It was 2 splashes of wine, one ounce each. I was given the option of taking my 2 splashes at once or get one splash and then get back in line to get my second. This way I could try 2 different wines. Of course I opted for my 2 ounces at once. I got my wine, found a place to sit down and relax and enjoy that I had just completed another half marathon. After I finished my wine, which didn’t take long at all, I headed down to get on the bus. On the ride back to town, I was able to have some pleasant conversations with some fellow runners. It finally started raining while I was driving home. – Close-ish to home and a fun theme. – Great location. I love Temecula and this would be a really fun weekend with friends to just get away. – Other runners were really wonderful and everybody was there to have a great time. – Good swag. Nice medal. – Challenging course with beautiful scenery. The race organizers really down played the challenging nature of the course. They advertised this course as being “California flat”. I had never heard this term before and after a Google search, I am convinced that they made it up. – Parking was a mess. The advertised parking did not even come close to having the capacity to provide enough spots for all the participants. Most the runners ended up parking on the streets and in another lot. Not a problem but the traffic director people were still directing people up to the garage long after it was full. – Not enough porta potties. I have done a few large races and have never seen the potty lines this out of control. The sheer amount of people stuffed into this small area was ridiculous. – Gear check was almost impossible to get to based on the proximity to the porta potties. The gear check was directly opposite the line of porta potties and all the queues to use the bathrooms were backed all the way up to the gear check table. – Wine tasting was only 2 splashes. Not really a perk worth advertising. After the ordeal I went through to get the wine glass and tasting, I wish I had done it the day before at the expo while I was killing time letting my kids run off some energy. – Winery staff was exasperated and in a bad mood by the end of the race. – Post race food was practically hidden and I had to ask other runners I saw eating snacks where I might find the food. It was located on the opposite side of the winery from the finish line. They had some chips and a handful of grapes. Literally, a hand full. I heard later that they had some romantic idea that we runners would use our empty wine glasses to put the grapes. I don’t think I have to explain the flaws in this plan. – No post race electrolyte replacement drink. Seriously?! I wanted to love this race. I expected more from a well established race brand. This race had so much potential but way too many flaws that need to get worked out. Next year they are offering jackets and light up tutus to sweeten the deal. I think they can and probably will improve on things but I am not willing to fork over $150 to find out.